Belle River F.C joined the Windsor and District Soccer League in the 2012 Season. Since then we’ve grown into 11 teams, from U-8 to u-17. If you would like to take your soccer skills to the next level, consider try out for Belle River F.C competitive Soccer. We are looking forward to a fun and successful season! CONGRATULATIONS!!! 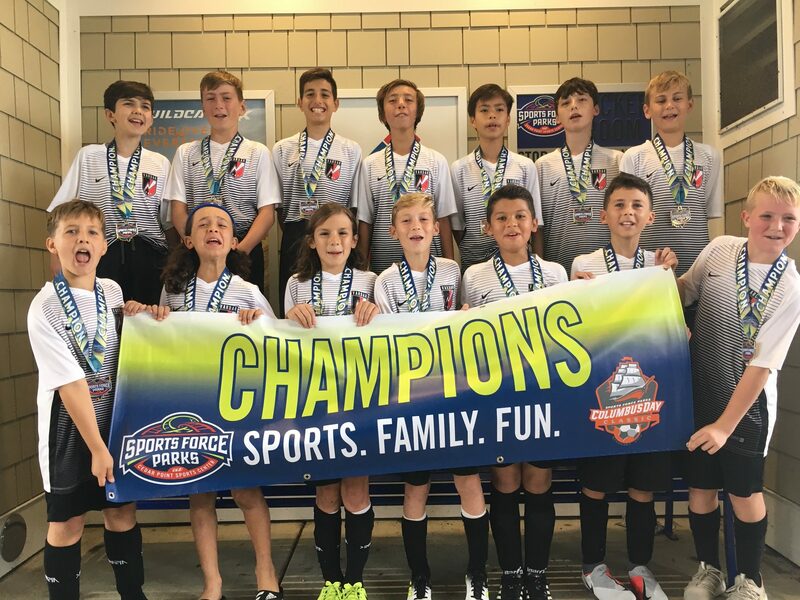 Our BRS 2006 boys took home the Championship at the 2018 Cedar Point Columbus Day Classic. By now, you have all heard the results of your tryouts and have been able to determine your soccer 2018/2019 year. Your coach has reached out and you are aware of your year ahead. Thank you to everyone who tried out. For those who have been selected this email is for you. TRAVEL TEAMS: 2011, 2010, 2009, 2008 and 2007 boys and girls. Your travel fees are $300 (taxes included) which you will play online with the link provided below. In addition you will pay $165.00 Canadian (taxes included) for your Travel uniform which will be good for 2 years. This link will be sent to you by your team manager in October after jersey numbers have been issued by your coach. Each parent will then order their uniform kit directly with the supplier and select their own sizes and additional items. The $165.00 Kit includes; Two Belle River Travel Adidas Jerseys (1 grey and 1 black), 1 adidas short, 1 adidas sock, 1 adidas jacket and 1 adidas bag. In addition to this, we are giving every travel player a 40th Anniversary Kelly Green Jersey for free. You are all required to purchase your own size 4 soccer ball. Your travel games begin in May and conclude at the end of August. Your travel fees include 1 practice per week and all league games. Your coaches will determine if and when you will attend any additional tournaments and if and when fundraising will take place. DEADLINE TO REGISTER IS FRIDAY NOVEMBER 1st. MONDAY FUTZAL for our ELITE Players. 2011, 2010, 2009, 2008, 2007 and 2006 players. Parents, if your child is a SOCCER SOCCER SOCCER Focused child, we are finally offering MORE Programing for them. This will be lead by Rob Arce (Argentina Coaching EURO License). Your travel team coach will not run this session. Your elite player needs to get outside training and additional training to supplement their development. This activity is a very skill focused session for travel players. These sessions are for our elite, soccer focused players. What is Futzal? It’s soccer designed to be played in a court and using a heavier ball, to improve juggling and dribbling skills. The cost is $400 total but it includes the full Futzall uniform, (jersey, short, sock) and a Futzall ball. Each player will receive this. Players that are not part of a travel program, will not be mixed in in these groups. will have access to Monday training and Saturday games, as well as the full kit. This runs from Monday October 15th to March 30th 2019. You register for this DIRECTLY by selecting MONDAY FUTZAL on the same registration account that you are registering for Travel soccer. DEADLINE TO REGISTER IS FRIDAY OCTOBER 5th. TRAVEL FOR 2006, 2005 and older. Registration for players who are 2005 or older is $350.00 (as the cost for referees has gone up and at this age, 3 referees are needed per game). and your uniform cost is also $165.00 per player. Your soccer ball is size 5. Travel teams will be assigned a 60minute to 90minute training session in one of our local school gyms. via your coach. Indoor begins in late October and runs until late March. Every travel team is assigned 1 night per week. 1) Travel players MAY NOT PLAY House League. 2) Travel teams who play Michigan Soccer (Fall and Spring) will do so under Belle River Vardar. 3) Travel players who do not make their team for the 2019 and 2020 season can opt to sell their entire uniform kit back for $60.00 to the club. 4) Travel players are expected to have their soccer ball pumped. 5) Belle River Soccer will focus on Ball Mastery in the first 5 years of travel. 6) Travel players who are cut BEFORE the start of the season are entitled to a partial refund (based on aggregate) after consultation with the club director. 7) Travel coaches are in place until August 2019. At which time, all coaches, and anyone else, can apply to coach for the 2019/2020 season. 8) Travel players CAN play up a year, if a coach needs extra players for a game or tournament. That is at the discretion of the two coaches. 9) Travel players are expected to attend; The 40th Year Anniversary Party, The Day of Champs Travel Showcase, and any and all of their team’s practices and games. 2011 Girls: we are not offering this team. We could not find a quality coach. We will not offer a program unless we have a quality coach in place. 2010 Girls: Coach John – 1 roster – 7v7 – size 4 ball – US Pilot Pathway. 2009 Boys: Coach JOE. Coach Joe will have try outs again in April. The current 2009 boys roster will train with Coach Sam over the winter. 7v7, size 4 ball. 2008 Girls: Coach Terry – 1 roster – 9v9 – size 4 ball (league games, 1 night of the week, May to August) AND Elite Michigan Spring Soccer Pathway. 2006 Girls: Coach Anthony – 1 roster – 11v11 – size 5 ball. This team plays in the Michigan elite pathway only. This team may also play ECSL. 2007 and 2006 Boys Program: Coach John. 3 rosters. 11v11 – size 5 ball. This team is divided into rosters who play in Michigan MYSL, MSPSP, and ECSL. 2004 and older work with coach Al. 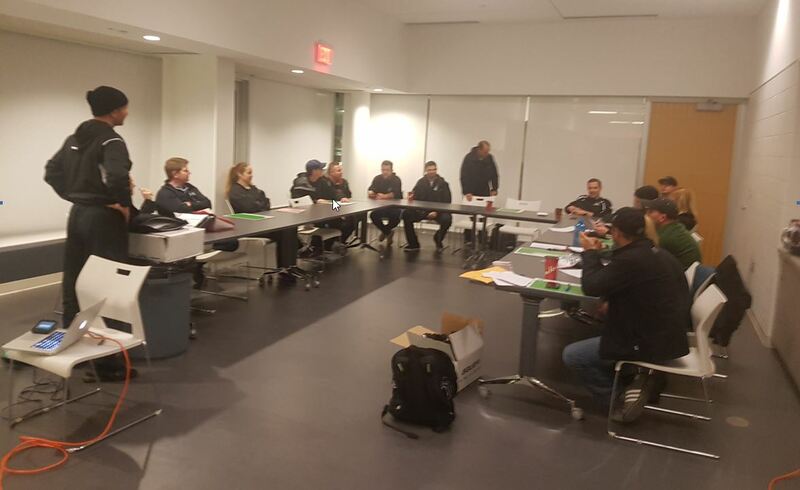 Below is a picture of our coaches and managers engaging in a travel planning session. Technical Director John Nabben presents, and he and our Travel Director Rod Demars answer questions regarding upcoming events and plans.